I was so impatient that I let Google translate all the published chapters just so I could read this story. I just can't wait for anything, but really... this translation is so much easier on my eyes. Thank you. Great work with the translation, as always ^^. "Small palaces" for "palacetes" sounds accurate to me. Congratulations! :D That's no small feet to achieve! I hope it'll be translated in English so I can read it one day~ I hope your first publish goes well. I wish you good luck with your book, and if it's possible it would be nice if you could post some information about it. 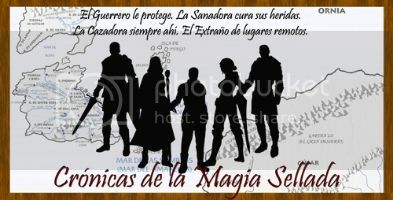 Well, that is a little sumary (for the people who can read Spanish, this is a review made by a friend who was my beta reader: http://www.fantasymundo.com/articulos/2685/libros_busca_editorial_cronicas_magia_sellada_helena_ramirez). *sigh* >.> I've been offering you guys since LAST year to help proofread this shizzle lol. But I guess you guys opted not to lol. Thanks for the translation. I really enjoyed reading this. 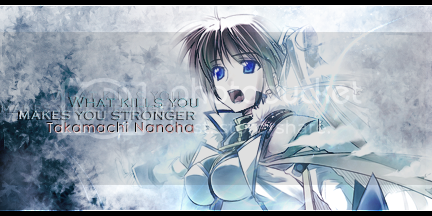 Finally sometimes alone for Fate and Nanoha. Thank you for translating this work. It's definitely a change to see Nanoha play as the antagonist and not as the princess. How are your staff handling this story? Is there a process where people sign up to help edit and or translate, or are you taking volunteers? I've been a quiet little lurker from Germany for some months now and you can say I caught the bug relativly late. I like Nura's story immensly...we both have a somewhat similar style and the fact that she's normally writing in spanish bothered me at first. But hey....I didn't study Spanish/business spanish for three years and failed the test twice to now be scared ofit. Right now I'm sitting on translating chapter 4 (en el camino) directly into english. The translation won't be that acurate since my study times were almost 5 years ago...but so far I managed. I'm not sure what is the current status of the translation project of this doujin, since I haven't seen updates on the English version of the novel in a while, and the people involved was a team formed by users of our site and was independent of the team translating doujins with whose we have constant communication. But if you can translate chapter 4 into English, please do post it here! I'm sure that if you need help with your English, we can get someone in this thread to proofread it, maybe from the people who worked in the previous chapters, or maybe someone else who is interested in seeing more of this awesome novel. And Nura: congratulations on finishing this novel! Unfortunately I haven't had much time to read fanfics, and I'm currently like 3 chapters behind finishing reading your novel, but I do plan to finish it as soon as I can. I'm sure I'm going to love it. And thanks again for making this possible. I'm not sure about the current status of this project, I think we haven't hear news from the people working on it in a while. If someone knows anything, please post in this thread. This novel is magnificent, and in my opinion is the most professional and best written Nanoha fanfiction I have seen. It deserves to be translated, but it's not an easy job taken in count its vocabulary and length. I speak spanish and I understand English, the only problem is that I can not express myself so well as I would like (english) but If I could help translate, I could do it with the translation group. Nice, it's good to know that this project is still going on Sigurd. If you guys need more people we can always post a message in the front page, just tell me what to write. Mh... I wonder if ZeroVirus or the rest of the staff is still active? Seeing the interest in getting this novel translated, maybe there are enough people willing to work in this to form a new group. But if you say that there are raw translations for the next chapters, the idea would be to don't redo work. hmm I wonder if a threat of a SLB Blaster bit level 3 would speed this up read the first three chapters and I've been waiting on this for over a year will someone get the translator/editor/proofreader/whoever is in charge of this project and hook him up to the mains grid maybe that will liven their ideas up? I can lend a hand if needed, but my knowledge of Spanish stops at no es beuno and me gusta. I can juggle a bit more with my course load since the head of my team is being a bit of a donkey. .--. Hinamori_Yuki@hotmail.com <-- le email with any info or stuffs to works on. That's nice Yuki, I think the people working in this project needed editors if I understood the previous messages correctly. I hope someone from the old team could visit this thread and see what can be done. I know this might be rude, but this project has been dormant for almost a year now, so here is my own translation of chapter 4. I hope this is up to your standards, I tried to be coherent with the old translated chapters, for example using magicians (even if I wanted to call them mages) but if you find anything to fix let me know. Well there has been some time hasnt it! i depply apologize for all the inconviniences this project suffered, unfurtanetely it seems the team kinda disolved XD, so all i can do for this project is hand it to anyone willing to keep it going, personal affairs keep me away from it(and form my own fanfiction) and i dont know if i can return to them, so as my farewell gift i leave behind the last translated chapters until chapter 8, they probably need edition so i leave it to whoever wants to edit them. once again i deeply apologize for not being able to fulfill everyone's expectations. That should have been a lot of work Crazyla, it's good to know that you're interested in this novel. This novel is very long, but I think it's definitely worth translating, and we have drafts until chapter 8 so we have a lot done already. If the situation is how Zerovirus says, I think we will have to form a new team if we want this novel to be completely translated, so if people is interested please post in this thread. If we can get a team I think I can create a page for this novel like the one we made for Das Resultat sagt alles to have everything together in one place, and put there the chapters as they are being completed. Indeed, I agree, I've read it all so I know for a fact that it just gets better as you go on, and I really want to share it with everyone here. Of course, I'm gonna edit the chapters zerovirus has provided, and then I can move on to the others. Any help would be welcome, of course, especially since I loose focus when re-reading after translating, and some typos might slip by. There's one thing that's bothering me and I'd like to ask for the readers' feedback, though. I'm hesitant to change the original writing style, but I really don't like long sentences in English, so I was thinking to start breaking up the long ones up in shorter sentences. What do you think, would it make it easier to write, or would you loose some of the atmosphere they create? You're picking up this project ? I'm not dreaming, right ? I don't think I could be of any help here since English is not my native language, sorry... but I want to say I kind of like long sentences, so... but it's up to you to decide, if they are really, really too long ! Yeah, people in chat suggested to keep the long sentences like you, so I will.